Last week’s other top-gaining mining stocks on the TSX were Imperial Metals, Largo Resources, Horizonte Minerals and Coro Mining. The S&P/TSX Composite Index (INDEXTSI:OSPTX) ended Friday (December 29) down 12.82 points, or 0.08 percent, at 16,209.13 points. Banks and gold miners were up that day, but their gains were offset by losses for base metals– and energy-focused companies. Overall, the TSX ended 2017 up 6.03 percent. According to the Globe and Mail, the index’s 2017 rise is lower than those experienced by American indices — the S&P 500 (INDEXSP:.INX), Dow Jones Industrial Average (INDEXDJX:.DJI) and NASDAQ Composite (INDEXNASDAQ:.IXIC) all gained between 19 and 28 percent. Imperial Metals is an exploration, development and mining company focused on base and precious metals. The majority of its operations are located in BC, and they include the Red Chris, Mount Polley and Huckleberry copper mines. The company did not release any news last week, but its share price leaped an impressive 41.67 percent to close the period at $3.35. Largo Resources is a growing strategic minerals company that is currently producing vanadium at its Brazil-based Maracas Menchen mine. The company has a six-year offtake agreement in place with Glencore (LSE:GLEN) for 100 percent of material from the mine. Last week, Largo’s share price jumped 34.02 percent to end at $1.30; it did not release any news during that time. 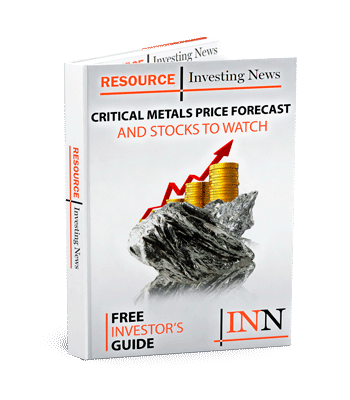 NioCorp Developments is developing its Elk Creek project, which it says is North America’s only niobium-scandium-titanium project. Last Thursday (December 28), the company announced that together with IBC Advanced Alloys (TSXV:IB) it has successfully manufactured several aluminum-scandium alloy ingots. Testing took place at a facility owned by IBC, and the scandium used was purchased commercially by NioCorp. The ingots represent a range of scandium content, and the plan is for them to undergo chemical analysis and metallurgical testing to confirm their microstructure and performance. The news sent NioCorp’s share price up 26.32 percent to close the week at $0.74. Dual-listed Horizonte Minerals is advancing the Brazil-based Araguia nickel laterite project, with production targeted by 2019. It did not release any news last week, but its share price rocketed up 25 percent to finish at $0.09. The company’s latest announcement came midway through the month, when it reached an agreement with Vale (NYSE:VALE) to acquire the Vermelho nickel-cobalt project. Coro Mining is a Chile-focused copper producer whose main assets include a 65-percent stake in SCM Berta. The company is also earning a 75-percent interest in the Marimaca project and wholly owns the Ivan SXEW processing plant. Last week, Coro’s share price increased 25 percent to close at $0.13; it did not release any news during the period. Data for 5 Top Weekly TSX Stocks articles is retrieved each at 10:30 a.m. PST using The Globe and Mail’s market data filter. Only companies with a market capitalization greater than $50 million prior to the week’s gains are included. Companies within the mining and precious metals sectors are considered.